After witnessing the advent of baobab gin, hop gin, cocoa gin, gin with ants in it, nettle gin and seaweed gin, you could be forgiven for thinking the flavour conveyor belt had run out of options. You would be wrong. Enter stage left the world’s first turkey gin from Portobello Road, a blend of organic turkey breast and 13 festive botanicals, from apples and pears to nutmeg and mace. Good job the turkey breast they used is organic, lest there be an outcry. You cannot overstate gin’s importance to the retail trade: sales are up 20% in value over the past year, providing more growth than all the other spirits categories combined (Nielsen, year to October 2017). However, there are now more than 400 gins in the UK as more and more artisan producers jump on the bandwagon, so it can be tricky for retailers to wade through it all and put together an effective range. a lot less crowded, and he believes he entered it just in time. Like many success stories over the past five years, Langley’s built its brand in the on-trade, gained listings at luxury retailers such as Harvey Nicks and Selfridges, then went into wider distribution with Oddbins and is now listed at the likes of Asda and Morrisons. But it would be difficult for a brand now to follow a similar path as the market is so packed. He notes that Waitrose has the largest gin range of any multiple retailer, with 30-40 on sale, so fewer than 10% of brands find widespread distribution. Meanwhile Asda, which has really pushed the category of late, only carries 25 SKUs, while a specialist retailer such as Gerry’s of Soho offers 70 gins on its website. If the vast majority of gins being produced by passionate, dynamic distillers must be rejected, how do retailers settle on those they will give a listing to? “For most retailers the biggest concern about putting any small, artisan gin on shelf is whether it’s going to move off the shelf,” says Dawkins. “You know the big six and own-label will sell well. If you want to stock another 10, 20 or 30, you need breadth of styles, choice without getting gimmicky, brands people are prepared to trial. Another brand that has stood out from the crowd is Whitley Neill, which describes itself as “the fastest-growing top 20 gin brand in the country”. Supplier Halewood also has the likes of City of London Distillery and Liverpool Gin it its portfolio and senior marketing manager Leanne Ware says brands that tell “a compelling and consistent story, steeped in heritage”, are reaping the rewards of the gin renaissance. “Provenance, production, botanicals and packaging design are all playing a part, with craft credentials increasingly becoming a central theme, just as we’ve seen in the resurgence of craft beer in both the on and off-trade,” she says. 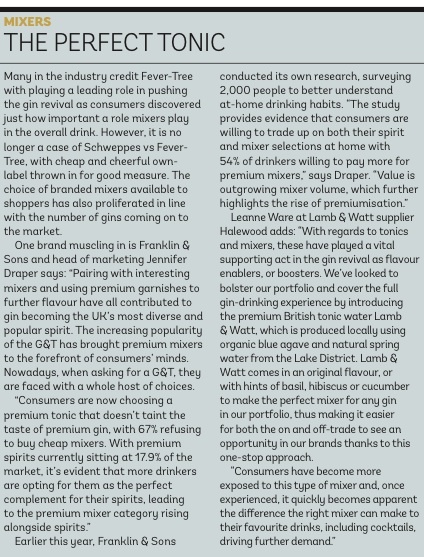 “Gin has been leading the way for a good 12 months now and it’s fair to say the consumer market has matured with it. As they follow the logical progression from discovery to fan, or aficionado, their desire to experience superior products increases, which is why we’re seeing a steady growth in the premium end. “One of the most impressive aspects of the gin revival has been the wealth of flavour innovation. This has not only reinvigorated the market and boosted the category’s appeal, but also driven consumer desire for more distinct combinations and experiences. This is reflected in Halewood’s current portfolio. From Whitley Neill’s Rhubarb & Ginger gin, to JJ Whitley’s Elderflower gin, we’ve backed our brands to do what they do best and create intriguing flavour combinations that will excite consumers, whether they’re new to the category or life-long gin fans. Gin and cucumber has become a classic flavour combination, pioneered by Hendrick’s, but the English Drinks Company has taken it one step further with its Cucumber gin (rrp £35). “Gin is one of the star performers in the alcohol category and its popularity continues to grow,” says Graham Carr-Smith, company founder. “It continues to show very strong annual sales growth and we’re confident there will be significant further expansion in the category. “Consumers are branching out from the well-known, established brands and are looking for interesting alternatives. This pattern of discovery is one of the key drivers for gin and retailers need to ensure that they adapt their ranges to meet these evolving consumer demands. “We’re finding sales in the off- trade are really positive. In retail, shoppers get the chance to pick up a bottle and read the label to get a sense and feel of what a brand is about before purchasing, and their response to our launch has exceeded expectations. This summer, after successful in-store tests, Cucumber gin achieved a national listing in all 200 Majestic Wine stores. “Ours is a genuine, authentic cucumber gin, rather than a gin merely flavoured with cucumber, and it’s this authenticity that helps it stand out from the crowd and makes it deserving of space on shelf. As the category evolves, more and more consumers are looking to trade up in search of increased quality and small batch offerings. heavyweights such as Gordon’s. “For a while the big brands will have their market share pinched and many entrants will grow,” he says. 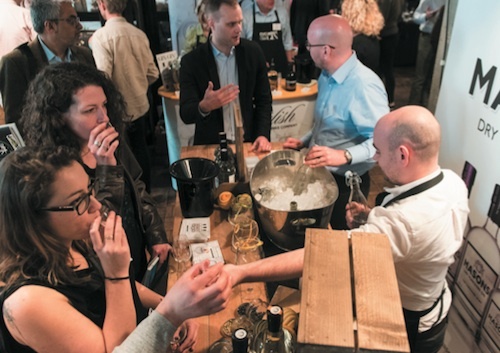 “Big brands will sit and wait for artisan gins to come out and then react. The two biggest catalysts for the gin revolution are Bombay and Hendrick’s. Bombay turned it into a category bartenders loved and made it trendy. Then Hendrick’s came along in a cool bottle, putting a piece of cucumber in it. Artisans came along to make it even trendier.